Until last week, I’d conflated William Lyon Mackenzie and William Lyon Mackenzie King, despite them occupying different centuries. I wasn’t entirely off-base, as the former is the latter’s grandfather. And both played an important role in the political life of Canada. But: two people, not one. This all came into sharp focus a week ago today when, passing through Queenston while from Niagara-on-the-Lake to Niagara Falls, we came to a sign pointing to the Mackenzie Printery. I immediately veered left, recalling that this was the site of an important part of Canada’s printing history, and a collection of historic printing equipment to boot. I was not disappointed: the Mackenzie Printery is the restored home and office of William Lyon Mackenzie (the elder of my conflation), a young Scot who immigrated to Canada at 25. He went on to found the Colonial Advocate, a important element in the march toward responsible government in Canada. The story of the Colonial Advocate itself is an interesting one. 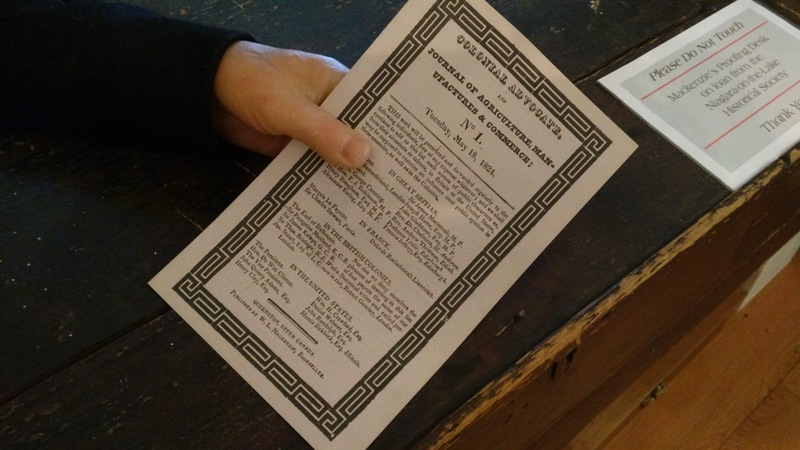 Issue № 1, which the Printery sells reprints of, lists the members of its initial mailing list, which included the Marquis La Fayette and the President of the United States. The balance of the issue is the report of a coroner’s jury about the accidental death (or was it!?) of one Colonel Nichol. Despite the 194 years since it was published, it’s a gripping read. 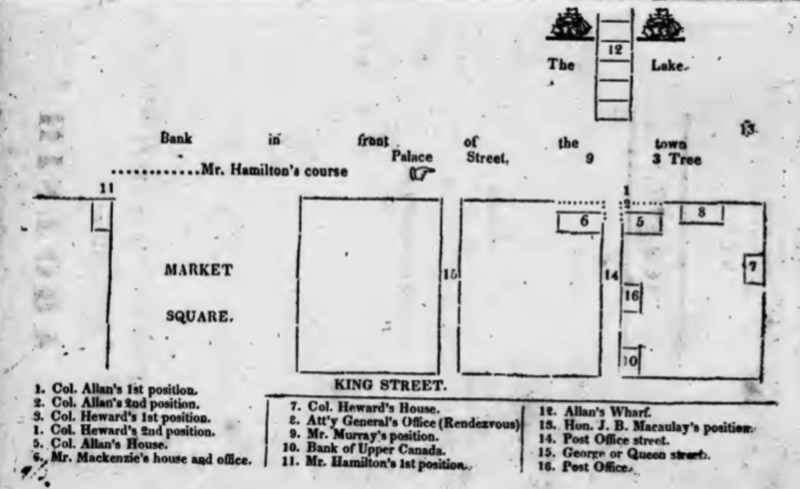 Two days later, Oliver and I found ourselves with a day to ramble around Toronto, and our travels took us to the same “Market Square” pictured in the map (the current site of St. Lawrence Market) and then up George Street to Adelaide Street (then known as Duke Street) to the site of Toronto’s First Post Office, now a post office again, and the site of a small museum of postal and local history. Where, as it happens, we found a sketch of William Lyon Mackenzie and a brief paragraph about how his advocacy included concerns about the corruption of the mails. 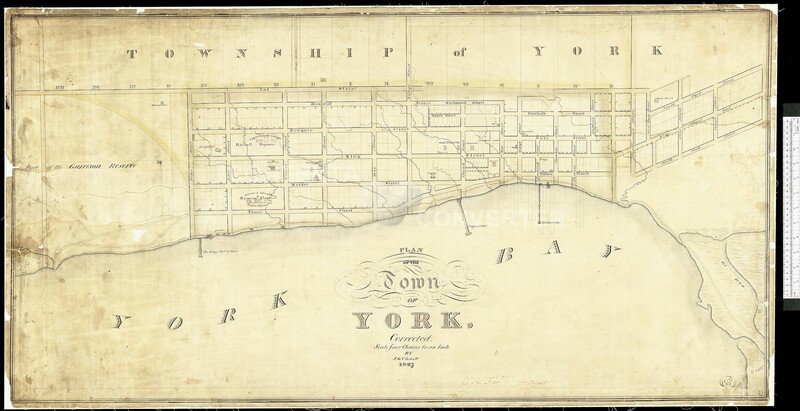 From the post office, we walked along Adelaide to Church, up Church to Dundas, and along Dundas to Bond, where we visited Mackenzie House, the townhouse where William Lyon Mackenzie lived at the end of his life. Between his early days in Queenston, beyond his publishing activities, Mackenzie declared an independent Republic of Canada on Navy Island in the Niagara River, served in the Legislature, was the first mayor of Toronto, staged the failed Upper Canada Rebellion, lived in exile in the USA, and served in the Legislative Assembly again. 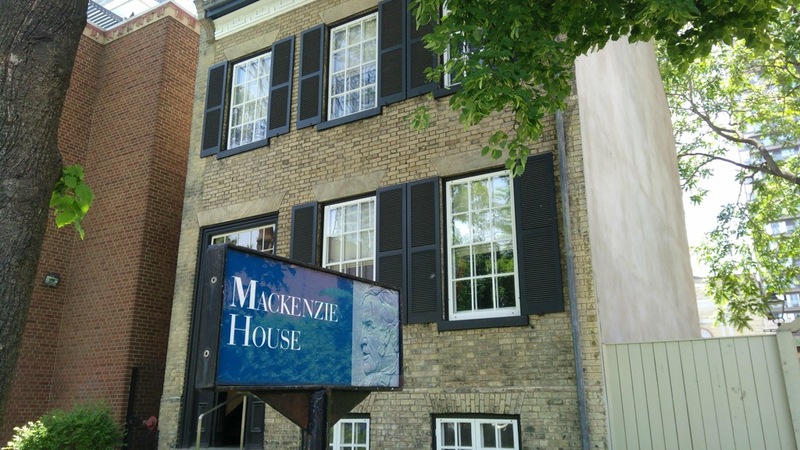 Mackenzie House, beyond its interpretation of Mackenzie and the life of his family, presents a tableau of mid-19th century middle class life in Toronto. We had an excellent tour guide to show us the house and to explain Mackenzie and his times, especially how his family fit into the social framework of the city. 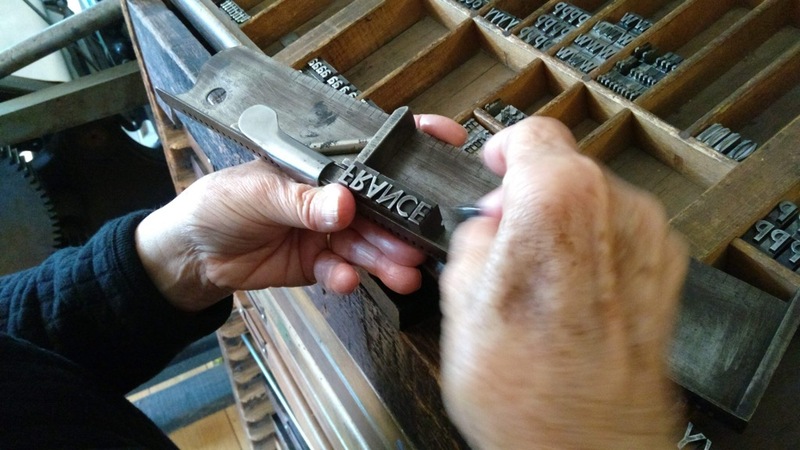 In the modern addition at the back of the property is a very complete print shop–another homage to Mackenzie’s life as a printer–where we saw a school group busy at work learning the basics of setting type and printing. The master bedroom of the house is on the top floor of the house and it’s where Mackenzie died in 1861. 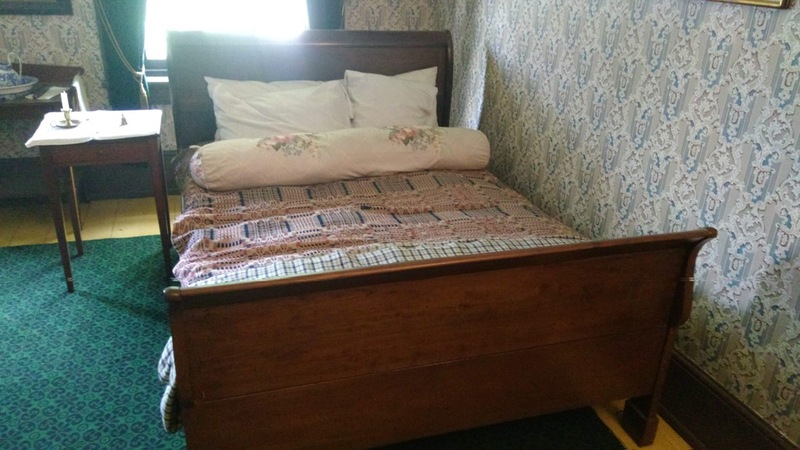 While his actual bed is no more the nightstand beside it was his own, and room had a palpable feel of historical importance to it. We didn’t go to Ontario to seek out William Lyon Mackenzie, but I’m so glad that he found his way into the fabric of our travels; he deserves more veneration than he’s received as a Canadian pioneer of printing, publishing and politics. 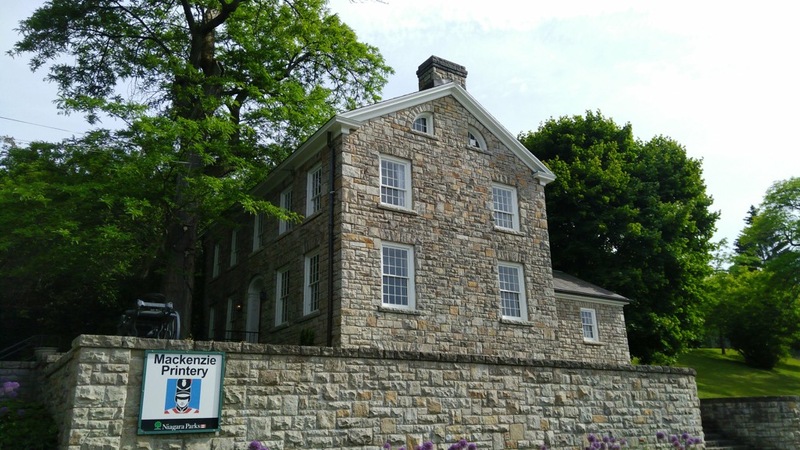 Written June 17, 2018 at 4:15 p.m.
Alex and I visited MacKenzie House in Toronto on one of her school field trips. It was a very interactive trip and the class was divided in 2 and proceeded to debate Responsible Government. I was always very impressed with the field trip opportunities in Toronto. I wish we had made it to Queenston as well.